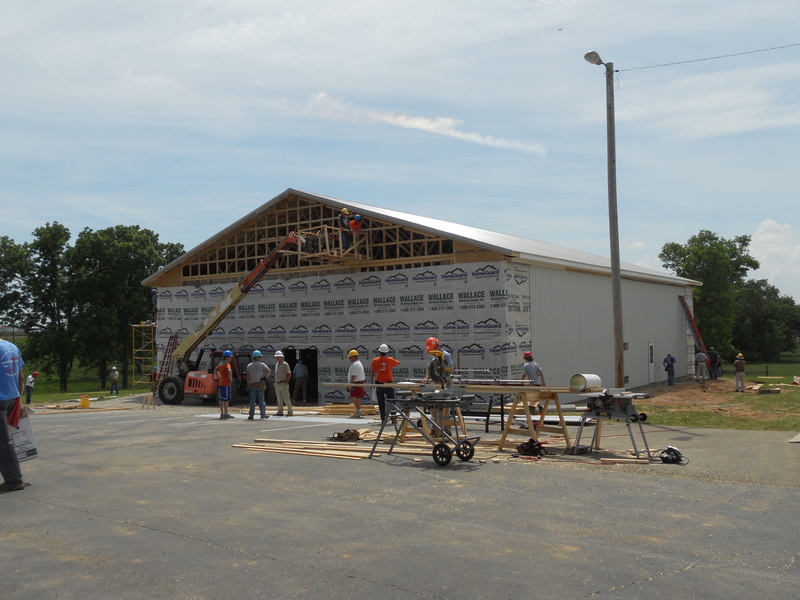 Salem Baptist Church in Pembroke (Christian County), KY has a new multipurpose/educational building, thanks to a team of 125+ Carpenters for Christ from Lakeview Baptist Church in Auburn, AL. Men from six different states (Alabama, Georgia, Tennessee, Virginia, South Carolina, Florida,) made up the team that came to western Kentucky the week of May 24 – 31 to construct a 60’ X 80’, 6400 square foot, 2-story building. Carpenters for Christ is a missions oriented group sharing the love of Jesus Christ by helping churches reach out to their communities. Through local projects and yearly mission trips, members donate their time to assist other Christians in building places to worship God and study His Word. Their primary purpose, however, is the building of disciples through prayer, Bible study, fellowship and service. The men pay their own way and many take their summer vacation to be a part of the team. They take time out of each day for worship and give the God the glory for the work He has called them to do. Twenty-one members of this year’s team were under the age of 20. This is a great opportunity for the older men to mentor these young guys in work skills and ethic, as well as spiritually, helping to build men of character and godliness. This process began back on January 4, 2013 when an email was forwarded to me from Don Green, Building Site Coordinator, introducing himself, stating that they were a team desiring to minister through a construction project during the Spring of 2013, and asking if I knew of a church that could use a team the last week of May. The Salem Baptist Church project, posted in October 2012, was sent to them, and the rest is history. Salem Baptist Church is in a rural area, has an average worship attendance of 125, and is in an area that is 87% unchurched. They are located near Fort Campbell and have set a goal to reach the military families, as well as their community, for Christ. In addition to Carpenters for Christ, Salem Baptist has 2 or 3 other teams scheduled to come in this summer to help with outreach activities. Thank You, God, for our Southern Baptist family, and a cooperative spirit to reach out to one another. Hi! Thanks for the article. I really lioe this article.